One of the key elements in most classic side-scroller gaming, especially “platformer” games, was jumping. Carrying all the way through to modern 3D games, for a wide variety of genres, the simple actions of running and jumping within a game, are arguably the single most important gameplay building blocks in video game history. This was established as early as games like Nintendo’s 1981 arcade classic Donkey Kong, and the Atari 2600 mega-hit, 1982’s Pitfall. But where it REALLY got its start, as an established “left to right, run and jump” type of gameplay convention, was Nintendo’s first true smash success, 1985’s Super Mario Bros. for the Nintendo Entertainment System. Super Mario Bros., for certain, set the groundwork for every platforming style game that would follow it. The entirety of the gameplay was based around this idea of “running and jumping” through a stage, hitting blocks and overcoming obstacles and enemies alike. And it was the fact that those in-game mechanics WORKED so well, and lent themselves so seamlessly to addictive gaming that was fairly easy to pick up and play, that it became so incredibly popular in the first place. To be perfectly honest, the jumping/platforming of Donkey Kong and the original Mario Bros. was slippery, awkward and wonky at best. Both great, groundbreaking games for their time, but it’s pretty clear that the boys over at Nintendo obviously hadn’t ironed out all the kinks yet. With Super Mario Bros., they achieved this, not only creating walking/running and jumping mechanics that felt very responsive and fairly seamless. But they also more or less single-handedly created the concept of a TRUE “side-scrolling” game, wherein you moved from left to right (or right to left, and even later up and down in other games), through one continuous level. In previous, more arcade-styled games, the action took place on a single screen. So even in something like the platforming predecessor Pitfall, you would traverse through a single screen, get to the other side, and then a new single screen of action would have to momentarily load. 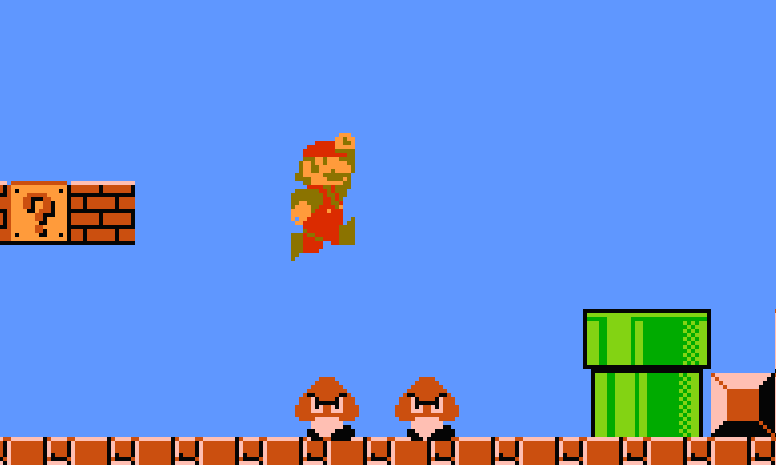 With SMB1, there was no loading or waiting within a contained level. You simply walked, ran, and jumped your way through what at the time must have felt like huge, expansive, continuous levels that just kept going until you reached the end (in Mario’s particular case, by touching the flag pole which represented the “Goal Point”). The End of a Stage. With SMB1, you just kept going, and it gave the player a whole new level of freedom. And almost of equal importance, what SMB1 also did, was it integrated some important elements of physics into the gaming world, where running and jumping had a real sense of weight to it. For instance you could really control your actions, like getting a good enough running start and jumping RIGHT from the edge of a pit, which if performed right would help you get just enough distance to make that next bit of ground. Or how when you hit a “question block” from below, to make a power up appear, that power up (unless it was a fire flower, which just stayed put), would either fall left or right, depending on which angle you hit the block from. For as primitive and limited as Super Mario Bros. might seem now to many younger, modern gamers, in all blunt honesty, it was so far ahead of its time it’s not even funny. It was quite revolutionary in its approach to many things, from continuous side-scrolling, to reliable in-game physics, to the novelty of different power-ups. It had separate worlds with different dangers, the variety of having ground and sky and even underwater stages (in which you had to master swimming physics, learning how to navigate both gravity and hazards underwater). If it didn’t outright create some of these elements, it certainly innovated all of them. And again, what brought it all together, what made it work, and made people care (in the millions, making the NES THE console to own in the mid-to-late 80s and Nintendo a household name), was that simple, yet great jumping gameplay. It’s fair to argue that had the jumping gameplay sucked, it’s entirely possible that Mario, and Nintendo, might be in a very different place today.